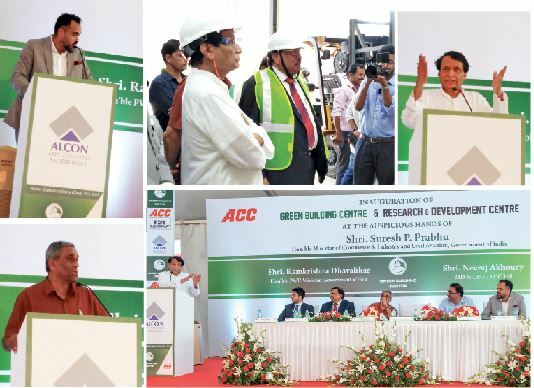 A green letter day for ALCON-ACC at Kundaim Industrial Estate: Green Building and Research & Development centers were inaugurated by Union Minister of Commerce, Industry & Civil Aviation Suresh Prabhu on Oct 21, 2018. Pictures depict (clockwise from left) Akaash Counto, Suresh Prabhu with Anil Counto walking around the Green Building Centre; Suresh Prabhu is all for green technology; keynote session; Goa PWD Minister Ramkrishna Dhavalikar giving his blessings; and (far right) a staff member gives a demo on a transportation buggy on the premises of the GBC industrial shed. PERHAPS one should say it was a green letter day out at the Kundaim Industrial Estate (the second oldest of Goa’s industrial estates) on Oct 21, 2018. It was a blistering hot Sunday morning when India’s ACC Ltd and ALCON – Anil Counto Enterprises, announced their venture to come together to promote sustainability in the construction industry with a Green Building Centre. Crème de la crème of Goan industry was present for the inauguration of the ACC-ALCON state-of-the-art and only one of its kind Green Building Centre by Minister of Commerce, Industry and Civil Aviation (Government of India) Ashok Suresh Prabhu and Goa’s PWD Minister Ramkrishna Dhavalikar, in the presence of MD & CEO Neeraj Akhoury of ACC Ltd. It was a mega occasion with several of Goa’s bigwigs present along with considerable family, friends, senior government officials, architects and engineers and media people. While congratulating seasoned, experienced industrialist Anil Counto for his futuristic vision, perhaps to his sons Akaash and Gaurav Counto must go the credit as part of second generation conscious of the overwhelming need to be sensitive in the construction industry and to such things as global warming, carbon footprint, diminishing potable water resources, etc, which impacting all life on earth in our times. What could be more sustainable in the construction industry than to recycle construction waste itself? The new Green Building Centre at the Kundaim Industrial Estate is aesthetically designed with administrative offices too altogether built across four acres of land. The green centre itself is equipped with German machinery to produce thousands of blocks and other concrete centred products per day to supply Goa and neighboring rural and semi-urban areas for walling, paving and other construction purposes. The new line of products is on display at the premises and will be prepared under strict quality control using locally sourced building materials with some part of it sourced from eco-friendly waste materials. ACC’s MD and CEO Neeraj Akhoury expressed ACC’s keenness in promoting more green building concepts in the country and focused on the fact that “we have only 4% of water on earth available.” Over-exploitation is driving a grim scenario of our precious water resources and this is what the green technologies which ACC is keen on promoting being the leader in manufacturing concrete, are all about. Goa’s PWD Minister Ramkrishna Sudin Dhavaliker expressed his happiness that such futuristic progress was happening in the Kundaim industrial estate which falls within his constituency. He also said the Central government has earmarked Rs5,000 crore to promote green ventures and some funds would also come to Goa. He would like Goa to show the way in becoming an IT hub for the country, “We believe rebirth is a good thing and the concept of cradle to grave must become cradle to cradle…this is recycling!” Re-cycling material with green technologies is both a new quest and new industrial revolution globally, he concluded. DEDICATED TO THOSE WHO DO NOT KNOW WHAT THEY WANT TO DO IN LIFE! Previous post: DEDICATED TO THOSE WHO DO NOT KNOW WHAT THEY WANT TO DO IN LIFE!